Storage wall systems can be built to any height, depth or width, with any finish (veneer, MFC, glass or metal), and are the perfect way of providing large volumes of storage, while being extremely economical with floorspace and costs. 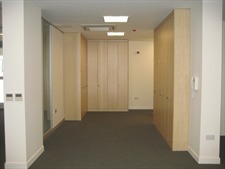 The internal fittings can be configured for lever arch files, lateral filing frames, pull out filing frames or pigeon holes. 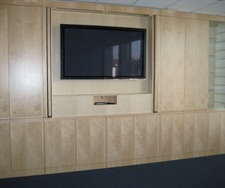 Audio visual walls and wired power sockets can also be installed. 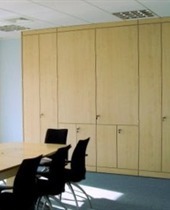 Freestanding units are available for ease of reconfiguring office space.